Matt had a tough time last night at the Home Run Derby, hitting just two longballs and both came with nine “outs” already but it seems he enjoyed it quite a bit and hopefully he’s saving his pop for the second half of the season. Have you voted for Matt and Andre yet?? Hard to believe that Kemp and Ethier rank fifth and fourth in All-Star balloting despite the monstrous season Matt’s having and the impressive numbers Andre continues to put up. Or perhaps even a write-in vote for Jamey Carroll, who has been tremendous this year and would undoubtedly relish a spot on the All-Star team. Dodger fans have answered the call before and helped get several former Dodgers to the All-Star Game in the past and this year. We need your help again! Remember, you can vote up to 25 times online and with our longest homestand of the year, hopefully we’ll get a strong push in-stadium, too! Come Together for a Cure! Jillian Michaels, host of The Biggest Loser will be out there and it’s all for a good cause, so check it out! Meanwhile, thanks for the reminder on the Inside the Dodgers Tour…just curious – how many of you would actually do this again? I’m just not sure how much more I could add this year that we didn’t do last year? There aren’t really “new” places to take you guys, so I’d hate to have you all come back to hear me give the same schpiel. And cpompe1: Yes, that was me at dinner with Tommy Lasorda on Saturday night in Boston. He invited a couple of us out to a favorite Italian joint of his and you can’t really say no to that offer, can you? Need to get back on track tonight in Anaheim. For whatever reason, we’ve never been a great Interleague team but that’s no excuse. We have to win some of these games against the Angels and Yankees…if you want to be the best, you have to beat the best, right? For those who have not yet heard, MLB and People Magazine have teamed up for the PEOPLE All-Stars Among Us program for the second year in a row. This Friday is the deadline and thousands of submissions are pouring in for everyday people who go above and beyond in their community. Maybe they mentored disadvantaged children, cared for abandoned pets or started a community garden. You tell us! You can even nominate yourself. A total of 30 everyday All-Stars (one representing each MLB team) will be honored at the 2010 MLB All-Star Game in Anaheim on July 13 and one will be featured in PEOPLE magazine. With the All-Star Game in St. Louis now behind us, the history of the Mid-Summer Classic includes a couple unlikely Dodger selections, one as a write-in candidate and the other amazing story of a Dodger All-Star who never played for the Dodgers. In 1974, first baseman Steve Garvey earned National League MVP honors while helping the Dodgers make their first World Series appearance since 1966. But Garvey wasn’t a household name at the beginning of the season and he did not appear on the All-Star ballot. Garvey, though, would join Rico Carty (1970 Braves) as the only write-in candidates to be elected to the N.L. starting lineup. Garvey became a 10-time All-Star with the Dodgers and Padres and he earned All-Star Game MVP honors in 1974 and 1978. The other surprising Los Angeles All-Star is relief pitcher Jeff Shaw, whom the Dodgers acquired from the Cincinnati Reds on the weekend before the 1998 All-Star Game. Instead of reporting to Los Angeles, which was playing in San Francisco, Shaw traveled from Cincinnati to Denver, site of the All-Star Game. Shaw hadn’t yet pitched for his new team, but nevertheless donned a Dodger uniform. We got a nice call from a longtime Dodger fan, Dr. Bob Filep, who was so impressed with the way Russell played during the All-Star Game, he wanted a forum where fans could express their gratitude and congratulations to him. So, what better way than right here, where so many of you visit regularly already? As many of you already know, today is one of the only days in the year where none of the four major sports are playing a game. But the MLB All-Stars have all descended upon Manhattan for tonight’s home run derby and tomorrow’s Midsummer Classic. We arrived here at about 1 a.m. and were at the hotel by 2 a.m., with Russell sure to have a busy few days ahead of him. You forget how much extra equipment a catcher comes with until you share a ride with him from the airport to the hotel. This morning it will be mostly media duties, as there is a press conference in about half an hour with Clint Hurdle and Terry Francona to announce their lineups and starting pitchers. Then each of the players is available to speak to reporters for about an hour-long session before everyone heads up to the Bronx Zoo…a.k.a. Yankee Stadium. There are going to be insane amount of people there but I expect it will be a very unique All-Star week. Yesterday at the Futures Game, Ivan DeJesus played the whole game at second base and had a couple hits and a walk. He’s among the best prospects in our system and hopefully everyone around the country is getting a chance to watch him play. 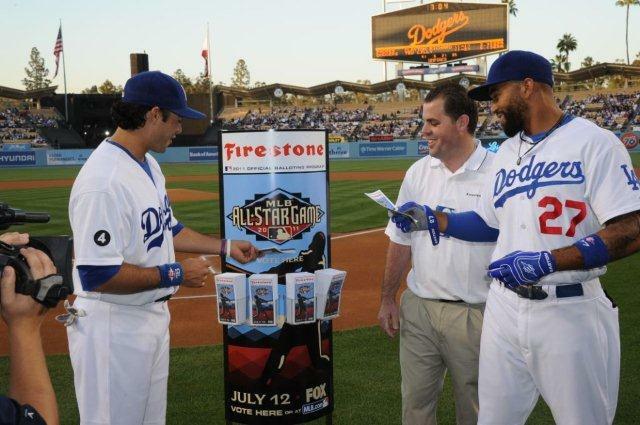 The Dodgers should have quite a contingent at the All-Star Game, even if Russell Martin is the only person on the field. Heading to Yankee Stadium to represent the club are Jaime Jarrin, Tommy Lasorda, Ned Colletti, and numerous others. I’ll be out there helping with media relations duties and looking for this statue in New York City (located at 57th and 5th Ave. in front of Niketown).